Has Kohl's Stock Risen Too Far? Kohl's stock has doubled over the past year, and it reached a new all-time high early last week. However, it still has more upside due to Kohl's solid sales growth potential. 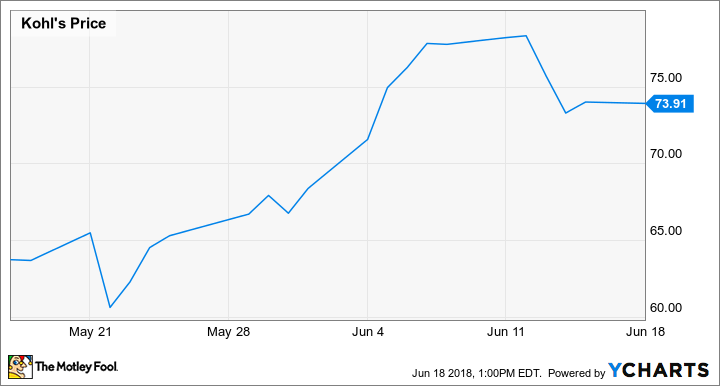 After initially declining following the company's first-quarter earnings report, shares of Kohl's (NYSE:KSS) went on a furious rally beginning in late May. Kohl's stock jumped 30% in the span of just three weeks, hitting a new all-time high around $80 last week. Since reaching that new high, Kohl's stock has suffered an equally rapid pullback. This slump was driven in part by a downgrade at Citigroup. Last Thursday, analyst Paul Lejuez and his team removed their buy rating on the stock, saying that it had risen too far and no longer offered a good balance of risk and reward. Kohl's Stock Performance data by YCharts. That said, while Kohl's didn't hit a home run with its first-quarter performance, the company is on track to post solid sales and earnings growth this year. As a result, Kohl's stock still has room to run despite having already doubled in the past 12 months. Kohl's has now posted three consecutive quarters of comparable-store sales increases. However, its rate of sales growth has been very inconsistent. In the third quarter of fiscal 2017, comp sales edged up just 0.1%. By contrast, comp sales surged 6.3% in the fourth quarter. Finally, Kohl's reported comp sales growth of 3.6% for the first quarter of fiscal 2017 -- but excluding a shift in the retail calendar, comp sales would have inched up just 0.4%. This succession of sales results makes Kohl's phenomenal fourth quarter performance look like an outlier. The big traffic gains it experienced in that period didn't continue in the most recent quarter. This is a big reason why the Citi analysts -- and many other investors -- are skeptical that Kohl's stock can continue to rise. Kohl's has posted inconsistent sales growth in recent quarters. Image source: Kohl's. In evaluating Kohl's comp sales trajectory, it's important to recognize the substantial impact of weather on its sales trends. Many clothing purchases are tied to the changing seasons, so unseasonable weather can cause consumers to delay or reduce their clothing purchases. In last year's third quarter, an unseasonably warm September weighed on sales of fall season merchandise. However, a cold snap that began in November helped boost winter clothing sales during the fourth quarter. Unfortunately, the cold weather and snowstorms continued well into March -- and even April, in some parts of the country -- reducing sales of spring merchandise last quarter. Thus, Kohl's fourth-quarter comp sales increase may have been inflated by weather. On the other hand, comp sales growth would have been significantly stronger last quarter (and in the third quarter of fiscal 2017) if weather trends had been relatively normal. In other words, adjusting for weather, Kohl's may not have seen much of a slowdown in traffic last quarter. This in turn suggests that sales trends could improve quickly going forward. Indeed, the early data are promising. The Department of Commerce's May retail sales report indicated that sales rose 2.1% year over year at department stores last month -- compared to a 0.6% decline in April -- while sales at clothing stores soared 5.9%. Driving more traffic to Kohl's stores remains the No. 1 focus for the company's management team. To achieve that goal, it's simplifying its loyalty program, partnering with other retailers, and adding new product categories. Kohl's is still figuring out some of the details, but it has a lot of promising options for boosting store traffic. As the company tests these strategies and rolls out the best ones over the next year or two, Kohl's could benefit from a steady rise in store traffic. Additionally, Kohl's is set to benefit from rivals' store closures, particularly the liquidation of regional department store operator Bon-Ton Stores. The last Bon-Ton stores will close in July or August, putting $2.5 billion of annual sales up for grabs. Bon-Ton is in the midst of liquidating all of its stores. Image source: Bon-Ton. Thirty-five percent of Bon-Ton's stores are within a mile of a Kohl's location, and 80% have a Kohl's store within 10 miles. This puts Kohl's in position to be one of the biggest winners from Bon-Ton's bankruptcy, particularly because most Kohl's stores aren't in malls that could suffer traffic declines as anchor tenants like Bon-Ton close. Despite its furious rally over the past year, Kohl's stock trades for just 14 times earnings. It is even cheaper when valued based on free cash flow. Additionally, Kohl's recently reinforced its already strong balance sheet by completing a tender offer for $500 million of debt. Kohl's has plenty of potential catalysts to drive meaningful comp sales growth over the next several years. That could support further margin expansion and cash flow increases. As investors gain more confidence in the company's growth trajectory, Kohl's stock could continue to reach new multiyear highs.